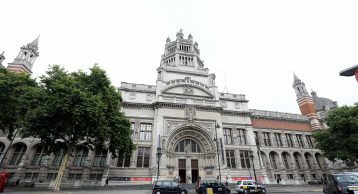 The V&A is the world’s leading museum of art, design, and performance with collections unrivalled in their scope and diversity. It was established to make works of art available to all and inspire British designers and manufacturers. Today, the V&A’s collection, which spans over 5000 years of human creativity in virtually every medium and form many parts of the world, continue to inspire, intrigue, and inform. Opening on 30 June 2017, the V&A museum celebrated its 165th anniversary by running a week-long public festival featuring art and design commissions, performances, fashion, family activities and collaborations with neighbouring Albertopolis institute. V&A’s Exhibition Road Quarter was designed by the Stirling Prize-winning British architect Amanda Levete. We are delighted to have worked with the V&A in installing high quality Aluminium Entrance Matting at this popular location in London. The client specified our flagship INTRAform Double Module Entrance Matting with a black anodised finish and 608 polyamide inserts for maximum moisture absorption – 5.4L/m² and for optimum durability and comfort. 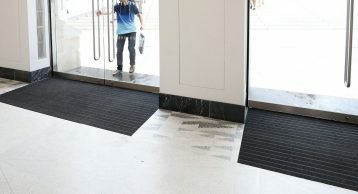 With an annual footfall of 3,376,300 the museum is certainly one of the most popular exhibition spaces in London, and this Entrance Matting installation was much needed as this footfall is set to grow at a constant rate. 98% of visitors to the V&A say they would recommend a visit to the V&A sites. This growth in visitors is excellent for the museum but it does bring its own difficulties too. 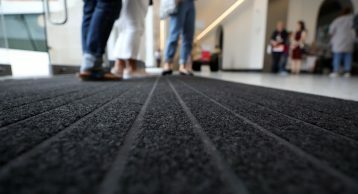 Increased footfall can create safety issues, did you know 90% of slip accidents occur on wet or contaminated floors, effective Entrance Matting significantly reduces the ingress of soil and moisture, and ensures safe access for every visitor. Increased footfall can have an impact on cleaning costs, which are estimated to be between £600-£1000 per kg of soil removed, by preventing the dirt and moisture from entering, costs are reduced. Other problems include the damage caused to internal flooring as a result of soil entering the building and scratching the internal floors. 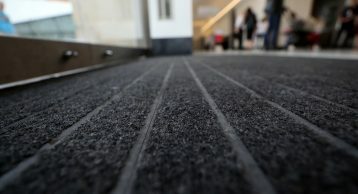 All these problems can be solved by installing effective Entrance Matting. 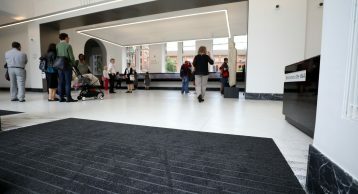 Our Entrance Matting is certainly the specifiers choice due to the design features, innovation in fibre technology and speed and professionalism in our delivery and installation. Contact our sales members who are always on hand to guide you through your next Entrance Matting installation and make your entrances a work of art. Call us on 01425 472000 to find out how we can help or visit our product page to learn more about the innovations behind the products. 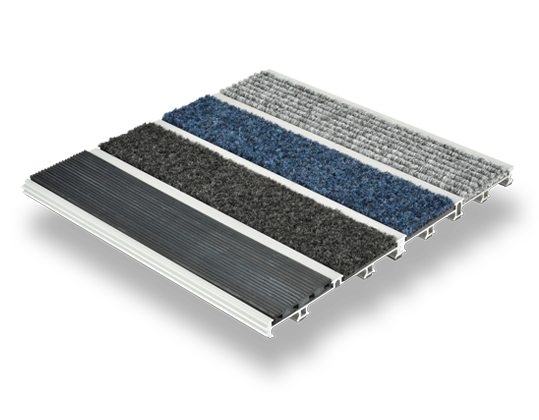 Heavy duty aluminium Entrance Matting with extra wide fibre inserts for optimum moisture absorption in high traffic areas.